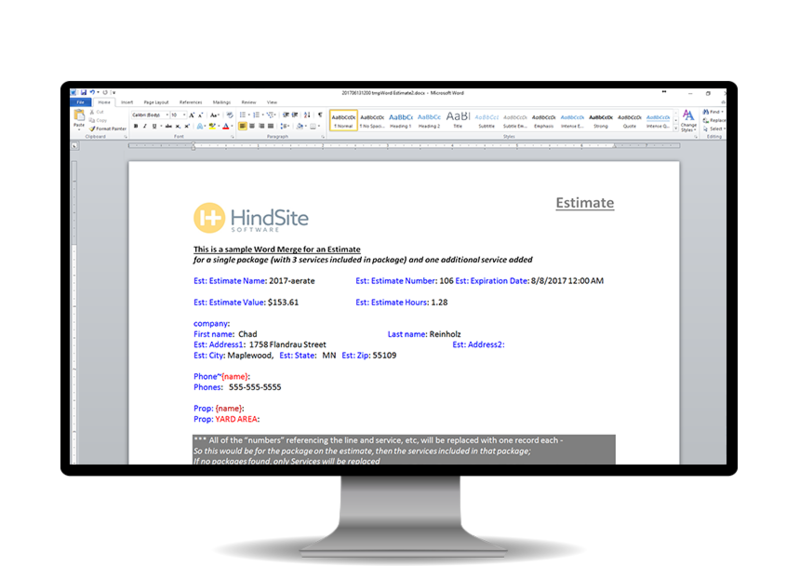 With HindSite’s estimating tools, you’ll save time creating and sending estimates. 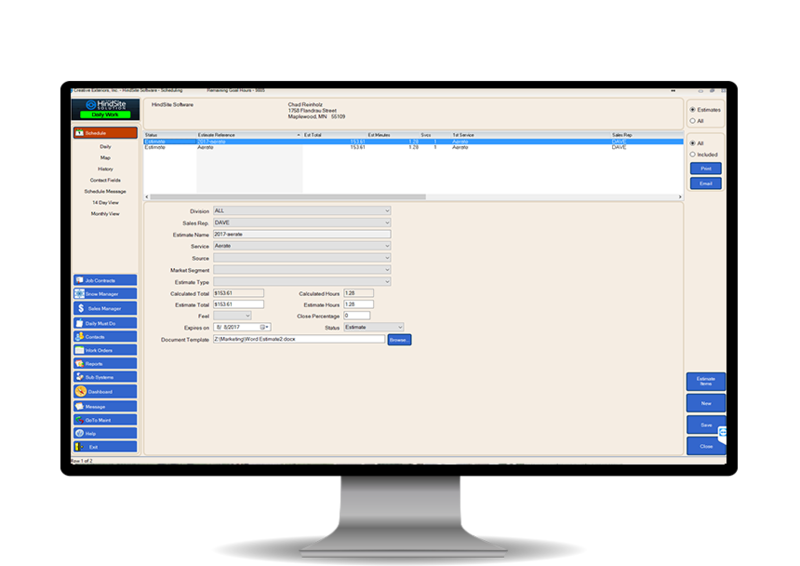 It’s completely configurable to your business, making it easy to incorporate into your existing estimating process. And you’ll earn more revenue because you’ll be the first to deliver an estimate to a prospect. There's a better way to create and send estimates. Once you've configured HindSite to your business, creating an estimate is a mouse click away. You'll be able to create an estimate while you have your prospect on the phone - without visiting the site! HindSite is incredibly flexible, making it easy to configure your estimates to the way you do business. You’ll setup your estimating items - like materials and production items - and then add those items to your services to create a template for each service. It’s a huge time-saver when it’s time to create an estimate. Studies show as much as 80% of business goes to the first busines to deliver an estimate. With HindSite, you'll be delivering an estimate immediately, without a site visit, so you'll be more likely to win the business. HindSite makes it easy to create estimate templates for every service you offer - complete with production items, part and material items, and a lot more. Once you've setup your templates, creating an estimate is as easy as retrieving some property measurements and clicking your mouse! HindSite's billing rules and estimate templates make it easy to configure to your business. From Simple to Advanced, We've Got You Covered. Setup can be as simple - or as complex - as your business requires. 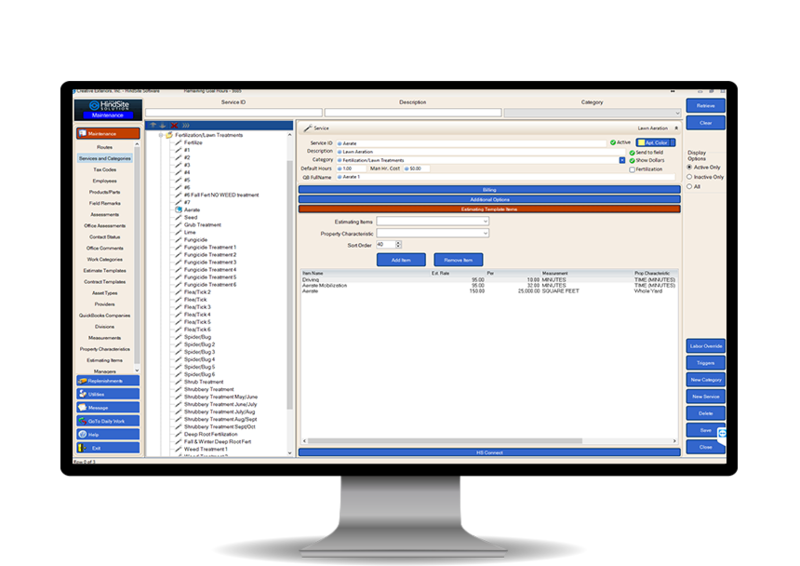 HindSite gives you the flexibility to setup estimating items - like materials and production items - within your business' parameters. Configure your services with estimating items for that specific serivice so you can deliver an estimate tailored to your business - and be more profitable. HindSite's Google Maps integration makes it easy to measure a property - without leaving the office. Whether you need to measure the front yard, a flower bed or the number of trees on a property, HindSite makes it easy to measure a property from the office. We've partnered with Google Maps to provide an as up-to-date view of your prospects' properties as possible. 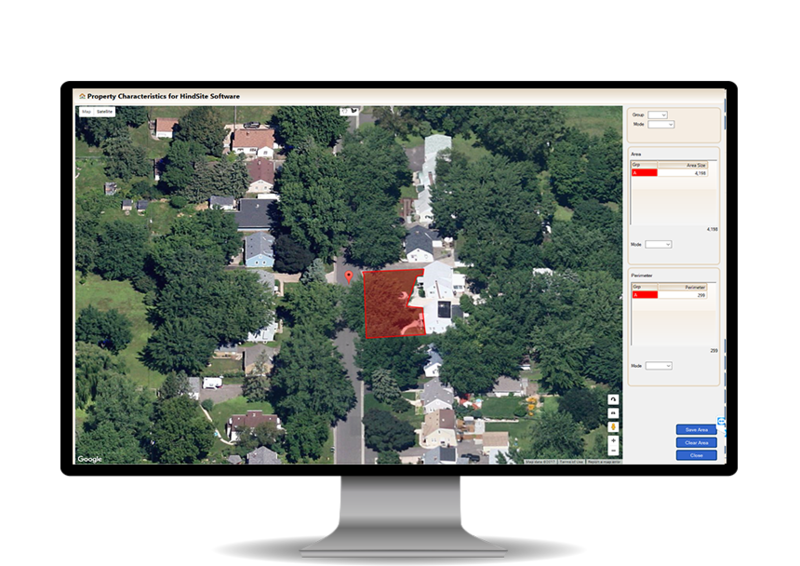 Whether you want to measure a flower bed for mulch, a front and back yard for mowing, a perimeter for trimming or a line for an irrigation system, HindSite delivers the tools you need to quickly measure a property. Have a lawn with a lot of obstacles? A steep hill? Lots of trees? No problem - just add a dfficulty factor to the property and HindSite will increase your resulting estimate accordingly. Once you've got your property measurements and estimating items setup, creating an estimate is as easy as clicking the estimate button. Your estimate will be tailored to the property and services you're providing. Plus, you can adjust it up or down in case you want to be more profitable or more competitive. Once you've measured a property, creating a estimate is as simple as clicking the Estimate button and entering the services to be performed. HindSite will provide a number based on the services and property measurements, but you can easily override that number and customize the estimate even more. Associate information like the sales rep, the industry, where the prospect heard about you and much more to yoru estimate record. It's all data that can help you analyze and improve your sales process. Once you've got all the data you need to create an estimate, printing or emailing it is as easy as pressing a button. You can leverage Word templates to create beautiful, branded estimates that include your logo and other formatting. Leverage our Word integration to merge your estimate data into a branded template. Alternatively, you can email your prospect a prospect. It's a great way to go from initial call to delivered estimate in a matter of minutes. Once you've completed your estimate, HindSite gives your sales reps the tools to track and manage the follow up for every estimate sent. Nobody wants to take a truck out of commission for a day and pay costly GPS implementation fees. With HindSite Tracker, you don't have to. 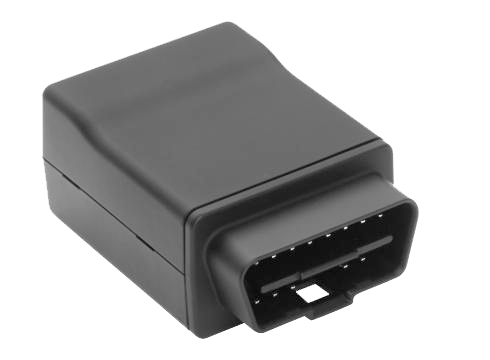 Simply plug the device into your OBD-II port, enter the device ID into HindSite, and you're ready to go. Any idiot can setup HindSite Tracker. Simply plug the device into your OBD-II port to start tracking your trucks. Associating your devices to your employees to enable the HindSite integration is as simple as entering in the appropriate device ID for the employee. We'll deliver training and unlimited support so you can get up and running quickly. Simple maintenance can extend the life and reliability of your vehicles. HindSite Tracker ensures you keep your vehicles in tip-top shape by enabling you to store a complete vehicle maintenance history. 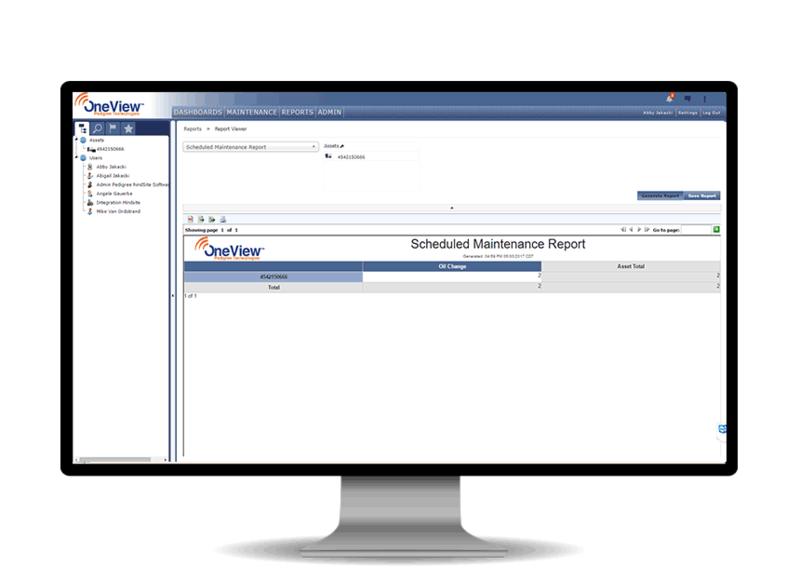 Plus, maintenance alerts ensure you never miss a scheduled maintenance event. From wear and tear like heavy accelerations and hard braking events, to past maintenance events like oil changes, you'll know everything that's happened to your vehicle. Alerts help remind you when to perform your next maintenance, so nothing ever falls through the cracks. Wondering about the fuel efficiency of each vehicle? How about the odometer readings for all your vehicles? A diagnostic code history? It's all available from HindSite Tracker's reports. Win the sale. Wow your customers.